The spectacular course at Kintore covers a large area of ground from the Don basin, overlooked by the clubhouse, to mature woodland at the far perimeter. Formerly a nine hole course Kintore was extended to 18 holes in the 1990s and now gives an interesting contrast between 'old' and 'new' nines. Burns criss-cross the course producing some very interesting and tricky holes. It’s not too long, measuring 6,126 yards from the medal tees, but it will punish you if you’re not careful. 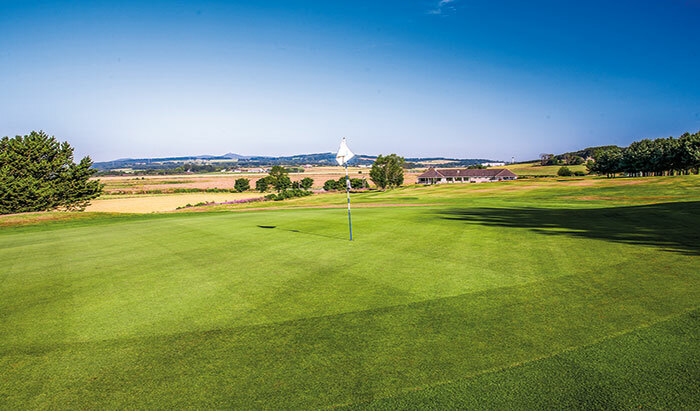 As well as a fine test of golf, players will also enjoy brilliant views over the River Don, stretching to Bennachie in the Grampian Hills. The clubhouse offers both changing and shower facilities, a full bar and catering to ensure you're refreshed and energised after your round and with a friendly atmosphere guaranteed. 1st – Your skills will be put to the test from the word go at Kintore with a tough opening hole. It’s a par-3 that measures 226 yards from the white tees and, from the yellows, it still stretches to more than 200 yards.